Chicano Park activists want their trove of artifacts to have a museum home, Balboa Park stakeholders spell out their priorities, Robert Irwin is having a moment and more in our weekly roundup of arts and culture news. Robert Kennedy is one of a handful of inmates at Donovan Correctional Facility who’s in an advanced playwriting workshop. In a class a few weeks ago, Kennedy stood up to explain what he gets out of writing plays and collaborating with other inmates. He said the creative process has been infuriating at times, but working through disagreements has taught him about healthy conflict resolution. He also said the experience has been therapeutic. Kennedy said he blamed himself for his dad’s death for a long time. It was just one of the factors that led him on his path to eventual incarceration, he said. Snippets of Kennedy’s story are in “I’M GOOD: Incarcerated Men Getting Over Obstacles Daily,” a 90-minute play Kennedy and other inmates wrote together that paints a detailed portrait of the men and the lives they led before prison. A staged reading of the new play will be held at San Diego State University’s Experimental Theatre from April 20-23. The playwright program at Donovan is part of the California’s Arts-in-Corrections program, which is run through a partnership between the California Department of Corrections and Rehabilitation and the California Arts Council. Back in the ’80s and ’90s, Arts-in-Corrections was held up as a model program that reduced recidivism, helped with rehabilitative goals and improved prisoner behavior. Despite its success, the program was slimmed down amid statewide budget cuts in the early 2000s then cut entirely in 2010. While a few nonprofit and volunteer groups continued offering arts programming to inmates despite the lack of state funding, the official Arts-in-Corrections relaunch didn’t happen until 2014, when Playwrights Project started its classes at Donovan. Cecelia Kouma, executive director of Playwrights Project, said she’s been impressed by the level of writing and the creativity that comes out of the classes. She said there’s a lot of outside interest in the work being produced behind bars, too. • The U-T’s Gary Warth sat in on one of the playwright classes at Donovan and talked to a few of the inmates about what they learned by working together as a team. Longtime Barrio Logan activist Tommie Camarillo has drawings of the kiosk that was eventually built in Chicano Park. She said the city first proposed a Spanish-style design but the community pushed back and came up with an Aztec-inspired design of its own instead. The community’s original kiosk drawings are part of the huge collection of binders Camarillo keeps in her home. 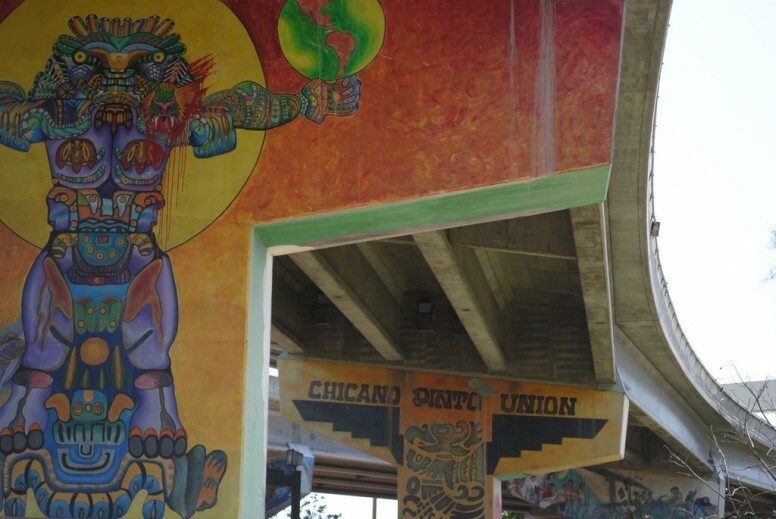 Each binder is packed with pieces of Chicano Park’s history, everything that’s happened since the public park and its huge collection of outdoor murals was first established after a community protest in 1970. Camarillo and others are now working toward opening a museum and library where she can store her archive, stage related exhibitions and hold community classes. The group has a name for the project – the Chicano Park Museum and Cultural Center – and now its working to secure a lease on a city-owned building that butts Chicano Park. • The Balboa Park Conservancy, a nonprofit started five years ago to help raise money for the park’s estimated $300 million in needed repairs, is settling on a process for prioritizing projects. VOSD’s Lisa Halverstadt reports on stakeholders’ chief concerns when it comes to the city’s cracking crown jewel. • Sometimes, people will be looking at an installation by San Diego artist Robert Irwin and they won’t even know it. The famed artist’s work is often understated on purpose. He likes to play with people’s perceptions and offers quiet surprises to those who take a minute to step back and let it sink in. Irwin’s certainly appreciated in the art world, but the U-T reports that he’s currently enjoying a moment in the sun thanks to a few East Coast exhibitions and the upcoming unveiling of his biggest installation to date. VOSD’s former culture reporter Kelly Bennett followed Irwin as he did his thing at the federal courthouse downtown. IMHO, Carone was at her best when she was capturing the region’s quirky and most beloved characters and subcultures, like this one about Albie’s Beef Inn or this portrait of Leonard Knight, the man who built Salvation Mountain in the Imperial Valley desert. • Local artist Bhavna Mehta has made a name for herself through her meticulously precise cut-paper pieces that often depict dense narratives about women and other subjects she cares about. Art critic Robert L. Pincus details the artist’s work in KCET’s Artbound. He stops hy her current exhibition at Bay Park Press in San Diego, where Mehta has traded in the sharp knives she typically uses for needles and thread, sewing detailed images and stories onto paper. • I love hearing songs like John Lennon’s “Imagine” being played by the chimes of the carillon tucked away in Balboa Park’s California Tower. Soon, Balboa Park’s official carillon player, Gina Seashore, will roll out another big crowd-pleaser: Queen’s classic-rock anthem “Bohemian Rhapsody.” The U-T’s Karla Peterson talks with Seashore about how she keeps the civic carillon library fresh (anyone who climbs the California Tower can add their requests to a song-suggestion box near the carillon). • Last week, I went on NBC San Diego and explained the rules guiding street performers. • Shara Fisler, founder of the Ocean Discovery Institute in San Diego, made an appearance on CNN’s “Heroes” page. • These are the four of the best new bands in San Diego, says music writer Jeff Terich on the The San Diego Tourism Authority’s blog. • National Grilled Cheese Day went down last week and the U-T put together a cheesy slideshow to celebrate. • Foodies already know that Carnitas Snack Shack is opening its third location on the embarcadero downtown but Eater San Diego rounded up 10 things ya’ll might not know about the meat-centric eatery. • The Reader’s Ian Anderson reports on the 16 San Diego breweries that earned medals at this year’s Los Angeles International Beer Competition. • When famed gypsy brewer Mikkel Bjorg Bergsø opened his new location in Miramar Saturday, San Diego beer geeks lost their collective marbles. “#sdbeer life just got a whole lot better” one such geek wrote on Instagram. • The high-alcohol kombucha being made in the South Bar made it in the Culture Report last week. San Diego Magazine’s Troy Johnson sat down with one of the Boochcraft co-founders to talk more about the locally made fermented tea.